What Death Note Character Are You Most Like? 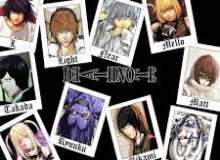 Death Note is well-known for being a manga (and anime, and Japanese movies, and musical, and...actually, that’s it.) with some seriously weighty questions about justice, right and wrong, and knowing (or not knowing…) when to stop. But all of the "which character are you" quizzes for this fandom are horrible if I'm honest. The questions are too blatant--"What's your favorite food/color/sitting position?" It makes it too easy to cheat and pick who you want. I intended this quiz to be a bit more accurate and ask serious questions rather than silly ones. Take your time, and pick what YOU agree with. I hope you enjoy it! Would you use a Death Note if you found one? I'm the one that dropped it, you fool. Yes, but I'd make the world a better place with it. I'm not a psychopath. Yes, but I'd only pick it up, not use it. I swear. No, I'd never dream of even touching it. No, I'd wait until somebody else picked it up and then attempt to influence them. What defines "justice" for you? Justice is seeing the guilty perish to protect the innocents. Justice is decided by the law. It's not on us to enforce it. Justice is using whatever means necessary to reach your ends. Justice is when everyone gets what they deserve in the end. Justice? At the end of the day, justice means nothing. Why worry? Do you consider yourself "immoral" at all? Yes, I'm a despicable human being and I'm ashamed of it. No, not if my idols do things like it. No, I simply do what I must to survive. Why should I care if I'm immoral or not? We're all a little of both. What are/were people's first impressions of you? People are often intimidated by me, or even scared of me. They sense I'm a leader, and automatically give me the respect I deserve. Many call me unconventional or eccentric. Basically, weird or strange. People think I look popular. I'm often asked if I'm a film star or something. They think I'm boring, or they don't notice me. I do whatever I have to. Forget the rules. What is life without rules? What rules? Rules were made to be defied. I play by my OWN rules, if that's what you're asking. Most rules are able to be followed, although others were made to be broken. Half my lifespan for the ability to see other's names and lifespans? What would I even do with that information? I'm fine on my own--I don't need it. Sure, why not? Everyone dies eventually, and it'd be cool. No, that's absurd. I have too much to do as it is. If someone I loved really, REALLY needed it, then possibly. Kira and/or Light Yagami. He's sly and manipulative when he needs to be, and yet still personable. L. He's cunning and intelligent, and will do whatever he needs to get what he needs. Misa. She will do anything for true love. Soichiro. He always strives to do the right thing, even if he doesn't always know just what that is. Ryuk. All he wants is to be entertained. Oh--and apples. Are you kidding? I'd lead them off. Why are we jumping off a bridge? Are you kidding? I've got too much self-worth to follow the flow. How do you prefer to solve problems/make decisions? I can usually use my head and logic my way through everything. ...is brute force an option? No? Calmly and rationally, with a level head. I don't. I leave them up to people in higher places of authority. I just go with my gut. It hasn't failed me yet. Which of these personality traits do you personally see as weak? Relying only on your mind and brain. Doing anything for a singular cause, whatever those may be. Relying only on your muscles and brute strength. Keeping too much of yourself hidden from other people. Quiz topic: What Death Note Character am I Most Like?